"As Time Goes By", produced by Janet Russell, is a 5-voice jazz ensemble performing a chronology of American Pop Music from the 1920's through the 1990's. 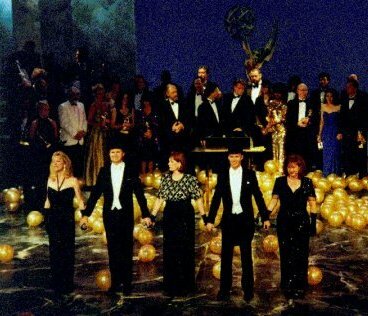 Shown above as they performed the grand finale at the Emmy Awards. Their new compact disc of jazz classics of the 1940's will be released in the summer of 1997.